Two-tailed Swallowtail (Papilio multicaudata) butterflies are found throughout western North America and in most of Arizona. Here in southeastern Arizona, Two-tailed Swallowtails are most commonly seen in riparian canyons with running water. In late March, I observed this male Two-tailed Swallowtail mud-puddling (drinking salty fluid) at the edge of an evaporating stream in the Sutherland Wash in Catalina State Park, Arizona. Two-tailed Swallowtail butterflies are relatively large, with an up to 5 inch (12.7 cm) wingspan. 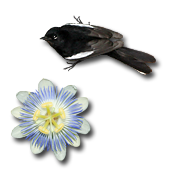 Their yellow wings are broadly edged with black, and they have black, tiger-like stripes running down their wings and a distinctive pair of black tails on each hindwing. 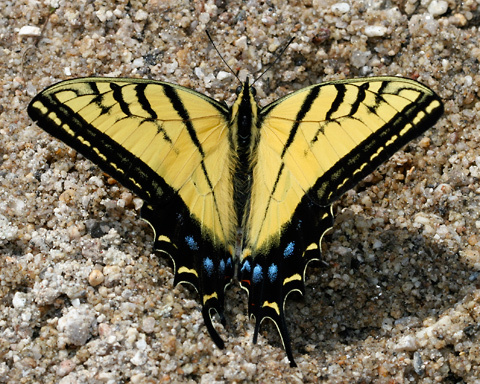 Male Two-tailed Swallowtails have narrower black wing stripes than the more broadly striped females. Western Tiger Swallowtails (Papilio rutulus) are very similar in appearance, especially to the females, but they have only one tail on each hindwing, and thus can be easily distinguished. Two-tailed Swallowtail caterpillars feed on the leaves of a variety of trees and shrubs, especially riparian trees like Velvet Ash (Fraxinus velutina). The beautiful adults feed on flower nectar and can be attracted to garden butterfly flowers in some areas, although I never did spot these butterflies in my Tucson garden, perhaps because I lived too far from the riparian canyons they prefer.